Frankenjeep(tm) leads a dangerous life by moving about in daily traffic. The above illustration represents what it felt like in a near accident that I almost had, coming home from Tyndall AFB, FL. See there was this gomer driving along at the posted speed of 45mph with his right turn signal on. This went on for miles when all of a sudden he slammed on his brakes and made a right turn. I slammed the brakes on Frankie and immediately began to swerve to the left. I tried to correct but in that same instance the wheels on the right went into the air. I don’t know how far they went in the air or even if they went into the air…all I can tell is that it sure as heck FELT like it went into the air. 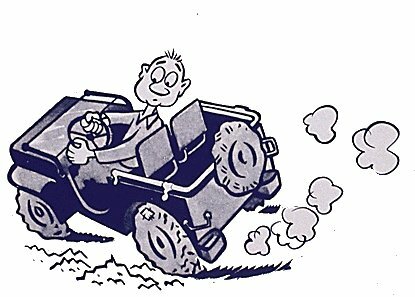 In just the wink of an eye by turning the wheels to the left the jeep landed…all wheels on the deck! I immediately turned to the right down a side road. Pulled over and reflected on my life. A guy who had seen all this happen pulled up along side and yelled out, “You all right?” I responded that I was okay but that I thought I had lost a few years of my life…I think that is when I first considered that a roll bar might be a practical non-standard accessory.